When the 24-year-old Peter Hall unleashed the first English language version of Waiting for Godot at this very theatre 62 years ago, it caused a sensation. Members of the audience heckled and it won a unique prize for “the most controversial play” at the Evening Standard awards. English theatre was never the same again. And now? Unlike Look Back in Anger, which is credited with beginning modern drama the following year, Godot’s mix of existential angst and companionship hasn’t dated. Productions proliferate and celebrities playing Vladimir and Estragon fill theatres effortlessly. 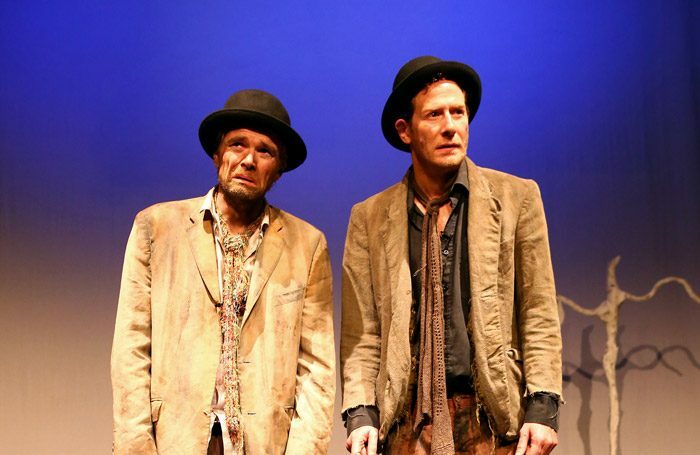 If it is no longer shocking, the endless waiting of the two tramps on a bare country road for the elusive Godot, their boredom, banter, interdependence and powerlessness, and the meaningless repetition of their lives, continue to resonate. They suffer, they entertain each other and, when the imperious Pozzo and his battered servant Lucky explode on to the scene, they inhabit roles as helpers and victims. Then a boy arrives (on press night a well-spoken Oscar Williams) to tell them – again – that Godot will not be coming today. This is director Peter Reid’s seventh Godot and he has directed all Beckett’s major works at least once. His Irish cast, three of whom have been with versions of this production for years, one since 2005, play together like a well-oiled machine. Nick Devlin as Vladimir and Patrick O’Donnell as Estragon warm to the music hall elements of their roles, rotund Paul Kealyn is a horribly imperious Pozzo and flaxen-wigged Paul Elliot an impressive, gabbling Lucky, all playing on an empty stage adorned with only a spindly tree and a boulder. It is a respectful rather than a revelatory evening, but this is, nevertheless, a welcome homecoming.